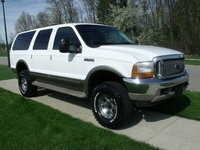 Start a new Ford Excursion question. Key Door Entry And Keyless Remote. 7.3 Diesel Stalls For No Reason.... Changed Fuel Filter. Any Ideas? The Ford Excursion was a great example of the 'bigger is better' mentality that dominated the US auto industry during the SUV era. Ford responded to strong sales from the GMC Yukon XL and the Chevy Suburban by beating them at their own game with the mega-sized Excursion. 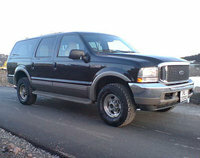 The Excursion was based on the Super Duty truck platform, and classified as a heavy-duty commercial vehicle. Weighing in at three and a half tons, the Excursion was, when it was launched, one of the largest vehicles ever marketed widely for passenger use. Not surprisingly, the Excursion's gas mileage was pretty dismal. Still, the Excursion did find a following among people who needed (or just wanted) to drive a sport-utility vehicle the size of a small European nation. The Excursion was axed in 2005, a victim of rising gas prices. It's still a favorite with tuners and project enthusiasts, though; there's a lot of Detroit steel to work with, and it's fun if you're not planning to drive very far.